An exhibition of work by Chicago-area artist Judith Joseph is now on display through August 31, 2017 in the UWM Libraries’ Daniel M. Soref Learning Commons and Hillel Milwaukee’s Joseph & Vera Zilber Building, 3053 N. Stowell Ave. The dual-venue exhibit, “Soaring Spirit: The Art of Judith Joseph,” presents woodblock prints at the library and ketubahs (Hebrew illustrated marriage contracts) at Hillel. Joseph will offer a talk on her work in the Libraries’ Special Collections on Tuesday, April 25 at 6:30 p.m. Her presentation will be preceded by an exhibition viewing 5 – 6:30 p.m. at Hillel. Judith Joseph’s art expresses spiritual flight. She uses the natural world as a metaphor for moral and personal struggle and growth. 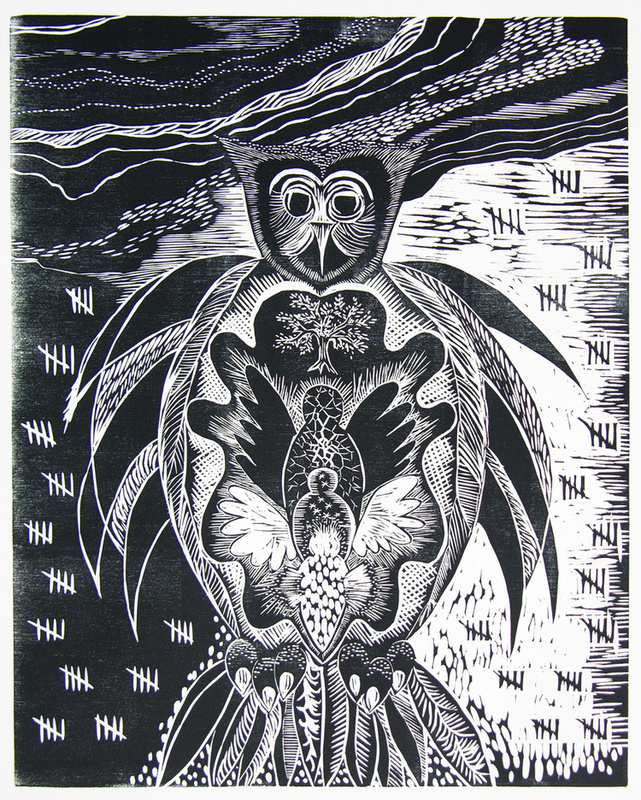 She thinks of her newest work, a series of woodblock prints depicting owls, ravens and other birds, as a series of spiritual self-portraits. Joseph’s work is permeated with Jewish lore. In her paintings, she uses the style of medieval icons and manuscripts to spin tales inspired by family migration and transcendent wonderment, personified by owls and peacocks in shimmering forests. In addition to her woodblock prints and paintings, Joseph is a calligrapher. Her specialty is the ketubah. Joseph was part of a revival of this ancient folk art form in the early 1970’s. Since then, she has created hundreds of unique original hand-lettered, painted works and designs for print editions. Joseph is a native of Milwaukee. She has lived and worked in the Chicago area since receiving her B.S. in art from the University of Wisconsin-Madison. She has been involved in making ketubahs since she was 17 years old, and has created hundreds of them as original commissioned works, along with commissioned paintings and illustrations. She has illustrated a book, magazines, zines and web publications. She exhibits her paintings, calligraphic works and woodblock prints widely, including solo and group exhibitions around the United States and in Canada. Her work is in many private and public collections, including the Chicago Public Library and the Milwaukee Public Museum. Joseph is on the faculty of the Chicago Botanic Garden and The Art Center, Highland Park, Illinois, where she teaches painting and calligraphy. She teaches an Artists’ Beit Midrash to help Jewish artists express their religion and culture, and is helping organize the Jewish Artists Collective/Chicago, a group which meets to share ideas and exhibits together. She is a member of the New York based Jewish Art Salon, which exhibits internationally.